Standard Aluminum Bike Frame: Reflectionight One-Step Powder - Color Light Bronze, material acrylic. This durable, smooth finish offers an aesthetically pleasing daytime finish. At night, Reflectionight's retroreflective paint, provides life saving retroreflective characteristics. This paint can be applied in standard powder coating application environment. This is the same bike frame as seen above. The photo was taken from 100 feet away in the dark of night. Every bike on the road should be powder coated with Reflectionight's retroreflective technology, improving nighttime road safety. Reflectionight's patented powder formulation and application process can be used to make any powder coating friendly surfaces retroreflective. Reflectionight powder coating paint is available in many colors, textures, and clear coats. This is the first ever reflective powder coating paint. It is easy to apply, cost effective, highly reflective, and the most durable, mar and scratch resistant paint in the world. Our reflective additives contain NO heavy metals. Our additives and portable application system transforms liquid paint surfaces. 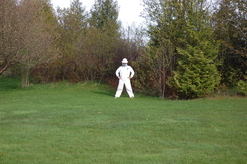 Guard-rails, post painting, parking lots and fire hydrants can all become retroreflective. This portable liquid paint process can be applied in the field....providing a cost effective and user friendly safety solution. 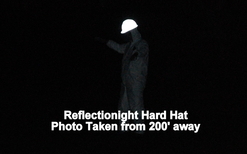 Applying retroreflective durable surfaces in the field is now possible with Reflectionight's new unique technology. Our mobile liquid paint application system, in combination with Reflectionight BeadsTM provides an easy application solution with life-saving results. Reflectionight will walk you through the process of bead application using your original OEM liquid paint. This is the most cost-effective and reflective paint solution available. Three fire extinguishers painted grey. The one on the left is a grey powder coat, the one in the middle is our Reflectionight One-Step black textured, very fine. The one on the right is Reflectionight Premium Dark Grey Texture. These are the same 3 fire extinguishers demonstrating the retro reflection at 90 feet. This photo was taken at 200 feet. This demonstrates the amazing illumination that our paint provides.....we offer the greatest retro reflective results. 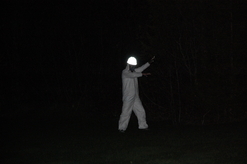 The super reflective can be seen easily up to a 1/2 a kilometer away. These fire extinguishers could be painted in any color with these fantastic results!